Real-Time Data (RTD) is a technology introduced in Microsoft Excel starting from version 2002, aimed at replacing DDE for updating spreadsheets in real time. It is possible to use Lightstreamer to push real-time data through the Internet and then inject it into an Excel spreadsheet via RTD. We have just released a demo, together with full source code, that shows this possibility. Telemetry is a kind of application where being able to push real-time data through the Internet, to any web browsers and smartphones, is a new fundamental feature. Are you using Lightstreamer for anything other than Financial Services? Let us know on our forum. On of the advanced features of Lightstreamer that sometimes is not notice when first dealing with the product is COMMAND subscription mode. It is a very handy way of pushing not only changes to the data rows, but even changes to the table itself (in terms of adding and removing rows). A typical example of this is a trading portfolio. You have a table with the list of stocks currently in your portfolio. 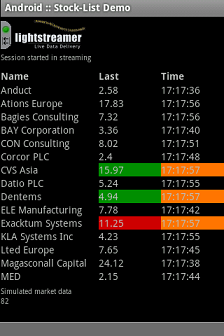 The value of such stocks keep changing based on the market, so some columns keep being updated. At the same time, you may sell or buy some stocks, resulting in removing or adding rows to the table. You want such changes to be pushed to the front-end in real-time too. A nice example of this is the online Portfolio Demo. Excel spreadsheets are often the main means used by professional traders to analyze data and make decisions. 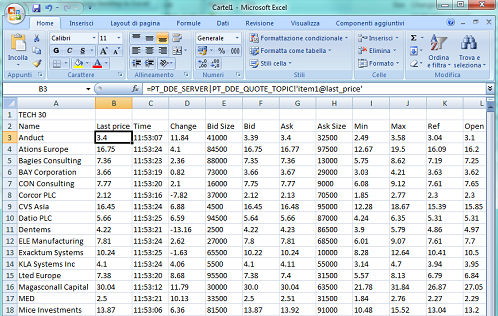 Being able to inject real-time data into Excel means boosting the capabilities of the traders. 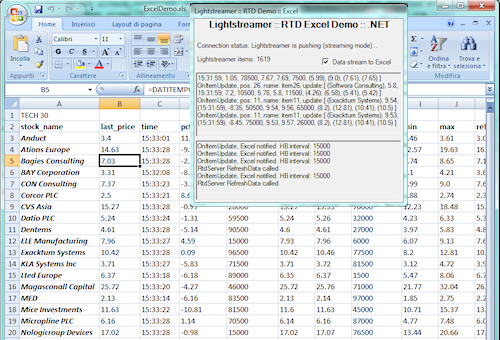 We have hosted a Lightstreamer-to-Excel demo for a long time, but we never provided the source code. We have now reengineered such demo and published online together with full source code. This way, Lightstreamer developers will have a good starting point to implement their own Excel applications. The Android operating system is spreading to more and more smartphones. Being able to deliver real-time updates to applications running on Android phones may be a crucial feature for many scenarios (from financial applications, to social and collaboration tools). Lightstreamer is a perfect means to push data updates to any application/device connected to the Internet, including Android phones. For this reason, we have decided to release an Android example for Lightstreamer, together with full-source code. This Android app, developed in Java, uses the Lightstreamer Java Client library to subscribe to 15 stock prices (as most of our typical "Stock-List Demos" do). The price updates are received in real-time, with very low latency, through a connection based on HTTP streaming. 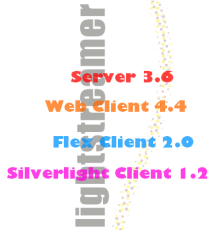 We have released a new Lightstreamer demo based on GWT (Google Web Toolkit). A GWT FlexTable is used to display the real-time data pushed by Lightstreamer. Full source code is provided, so that it will be easier to develop GWT applications that need to receive real-time data. After downloading the new package, please remember to get updated licenses. If you are a Moderato user, just generate a new license online. If you are an Allegro/Presto/Vivace user with a valid support contract, please get back to us.